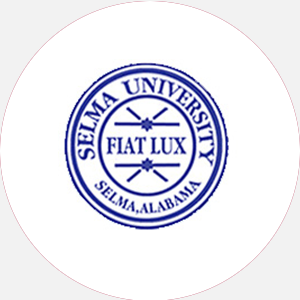 Selma University (SU) is a four-year, private, coed, liberal arts institution affiliated with the Al…. Selma University (SU) is a four-year, private, coed, liberal arts institution affiliated with the Alabama State Missionary Baptist Convention. It was founded in 1878 as the Alabama Baptist Normal and Theological School to train blacks to become ministers and teachers. Later that year, the school purchased the old Selma Fair Grounds and moved into the exposition buildings. Selma University was incorporated in 1881 under its second president who was born a slave. In 1884, under its third president, the first class of eleven men and women graduated. The institution was officially named Selma University in 1908, enabling it to confer degrees and grant diplomas. The University included an elementary school, high school, college, and theological school until 1956 when the precollege programs were discontinued. Owned and supported by the Alabama State Missionary Baptist Convention, Inc., SU continues to provide higher education to the black constituency in the state of Alabama, to the Selma community, and to the “Black Belt” region of the state. SU is dedicated to preparing students for useful and responsible living and for Christian leadership. The 35-acre, twelve-building campus ../includes the Jemison-Owen Auditorium-Gymnasium, the Stone-Robinson Library, and the New Dinkins Memorial Chapel, rebuilt in 1920 after a fire destroyed the previous chapel. Most campus facilities were built before 1980. Selma University is accredited by the Southern Association of Colleges and Schools (SACS) to award the Associate of Arts, Associate of Science, Bachelor of Arts, and Bachelor of Science degrees. Percentage of students receiving financial aid: 95 Financial Aid Specific to the School Army ROTC offers two- and three-year scholarships which pay tuition, fees, books, and a monthly stipend. August 15 (priority fall); Dec 15 (spring priority); Rolling admission. Graduation from an accredited high school (or equivalent) and completion of the following units: 3 English, 1 mathematics, 2 science, and 3 social science; Students should submit official high school transcript, letters of recommendation, and have a physical examination. A application fee is required. Admission Application Deadline: August 15 (priority fall); Dec 15 (spring priority); Rolling admission. Admission Contact: Director of Admissions, Selma University, Selma, Alabama 36701; Telephone: 334-872-2533 Ext. 29. A minimum of 66 semester hours and completion of the core requirements for an associate degree; a minimum of 126 semester hours and completion of 6 hours of mathematics, 6 hours of science, and 1 computer course for certain majors for a bachelor’s degree. Total enrollment: 287 From in-state: 273 Full-time undergraduates (men/women): 138/108 Part-time undergraduates (men/women): 22/19 Ethnic/racial makeup: African American, 273; Other/Unclassified, 14. Campus Regulations: Cars must be registered; class attendance and chapel mandatory; students must live on campus and purchase meal cards unless they commute from home; all freshmen required to take Freshman Experience for 1 credit. Campus Services: Health, personal counseling, remediation, and tutoring. Campus Activities: Social and cultural activities include musical concerts and a Lyceum Series. Annual activities include Founder’s Day, Religious Emphasis Week, Freshman-Sophomore Ball, Greek and club Shows, Class Talent Shows, and the Coronation Ball. The campus quarterly publication is the Selma University Chronicle. Leadership opportunities are found in the Student Government Association (SGA). Greek societies include one national fraternity and one national sorority. Phi Theta Kappa national honor society and one local honor society are represented on campus. Housing Availability: 200 housing spaces; first-come, first-served basis.